1. How did you come to study Ulysses S. Grant? - Purely accidental. My father purchased "Grant Moves South" by Bruce Catton at the Quaker Fair one Autumn Saturday and, knowing my interest in History, gave me this as a present. Upon completing that volume, I went for "Grant Takes Command" - the next in this series completed by Catton. That started to peak my interest so I went for "Grant" by Wm. McFeely. I was hooked, so I purchased the memoirs. Then, I needed to know more regarding his early life so I got a copy of "Captain Sam Grant" by Lloyd Lewis. This has to be the most definitive single volume on Grant's early years. Since then I have studied about a dozen biographies, a few several times over, plus related topics and a number of bio's on those persons that affected his life. I haven't yet learned all I am searching for in my quest to know this man. The more I learn, the more questions I ask. 2. When did you decide to portray him? - This decision was taken out of my hands by the public and re-enactors alike. 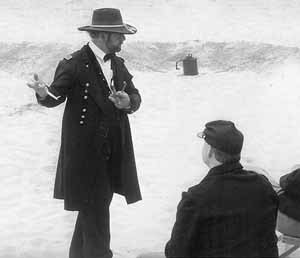 From the first season of re-enacting, this several years after my study of Grant began in earnest. 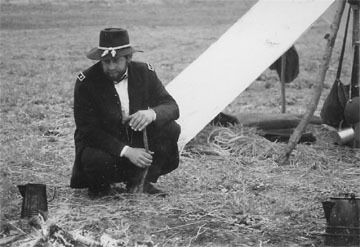 When ever I then portrayed a private in the Federal service, I was constantly looked on as "that looks like Grant". Hearing this too many times, over several years and having already horses in service as Infantry Staff mounts, I began to discuss this problem with my close fellow re-enactors. It was decided, mostly by myself, but with their concurrence, simply that if that is what I look like and that is what I study, then maybe I should give to the public the benefit of my knowledge and experience. 3. Talk to me about the "he" vs "me" defining line that all re-enactors attempt to cross? - Well, this is difficult to answer simply. His ability to know his failings, to learn from them and to be strong enough to admit them, publicly if necessary. His "no nonsense" way of getting a job done, he never did not move forward because he lacked all his needs. He never argued that he needed more of this or that before he could complete a job - He Moved Forward, knowing just one simple fact, no matter how poorly trained his troops were, so were those of the enemy. No matter how ill equipped his troops were, thus was the enemy. The one to get in the first lick is bound to win the contest. But in doing this he knew how to maximize his own resources for the benefit of his soldiers, thus the benefit of a positive outcome. These are traits in any man I would find most exemplary and should most like to incorporate in my own 'personality', thus these are the feelings and convictions that I hope to bring to the public's attention. 4. Do you have a favorite quote or anecdote about Grant? - "All I want to do is advance." 5. When not representing Grant, I understand your work is with horses. Do you feel this helps you to better understand the man? 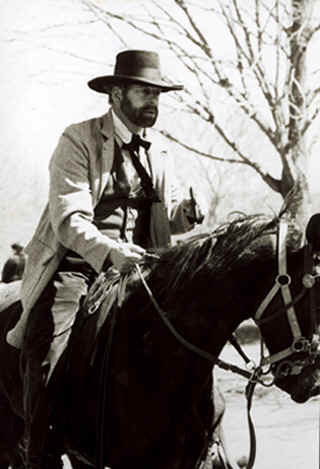 - Grant was, first and foremost, a horseman. To know horses is certainly a great help in understanding the man behind the myth. Actually, while I admit my bias here, I do not know how you can really understand Grant with out working closely with that which he so loved. The only thing he loved more than horses would be his Wife and children. 6. Do you ever lose yourself in this role? - If I'm lucky, I'm out there to bring Grant to the public's attention, not myself. This is to honor one of America ’s greatest average citizens, not to honor myself. I owe the public an honest portrayal of this man, not, to the best of my ability, myself as him. 7. What is your favorite part of presenting the General to the public? - There is no particular part, all I want to do is bring Grant and the world in which he lived to the attention of the public. These were the most trying times ever witnessed by so many during the entire history of the American experiment. To quote Mr. Lincoln, "A country with no regard for its past will do little to remember in the future." - This is as imperative now, I believe, than it ever has been in years past. 8. In the near future, how do you believe Living History will contribute to America's educational goals? - As history is not sufficiently covered at the school level, on the field, whether the High School ball field or at some other location, the ability to teach by example will, I hope, peek the interest of all who attend. Book learning is important, very important, but to weather a storm with your friends and associates or blister in the baking sun awaiting the battle, this brings true meaning to those words and concepts found in the books. For a few moments one can feel the pain and exhilaration felt by those who have left in print their experiences. With this knowledge of who we are, we collectively can go forth to continue this greatest of nations. 9. 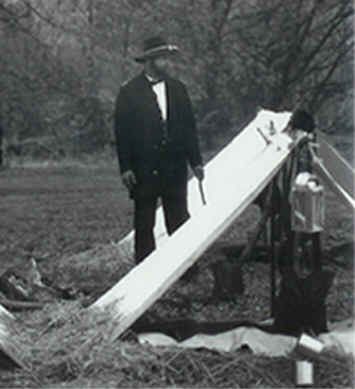 What advice might you have for people interested in becoming involved with Living History of the Civil War? - Learn your subject. You may find that your interest in the particular subject is thus satiated. Or you may be diverted to a subject yet unknown to you. This may well be where you want to go. In all events you will find that these studies will open a plethora of experiences and raise more questions than answered. But 'you' and those you discuss these findings with will be the better for you efforts.